A priest in Derry has said he would be prepared to go to jail rather than break the seal of confession. Father Paddy O'Kane was responding to the Irish justice minister, Alan Shatter, who said that forthcoming child protection measures, will "apply regardless of any internal rules of any religious grouping". A priest could be convicted of a criminal offence if they were told of a sexual abuse case and failed to report it to the civil authorities, under the new legislation. Mr Shatter said past failures in the Catholic Church had led paedophiles to believe they could act with "impunity". Father O'Kane, from Holy Family Church in Ballymagroarty, said he will not accept the rules. He said he did not think the law will go through. "If it does priests will be prepared to go to jail rather than break the seal," he said. "It's at the very core of what a priest is. If a priest were to break the seal he will be automatically excommunicated. Priests cannot function if they're not allowed to keep the seal of confession." A number of child protection measures were announced following the Cloyne report which was published last month. It found the diocese failed to report all complaints of abuse to police. 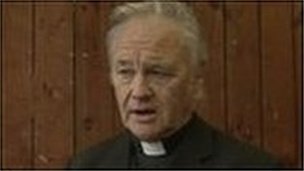 The inquiry into the Cloyne Diocese was set up by the Irish government in January 2009 following a report published the previous month.